All Stainless steel construction and components. 17-4 PH stainless steel forged, heat treated lifting ring with large opening. Important: Please review all operating instructions that are included in the packaging or online before use. 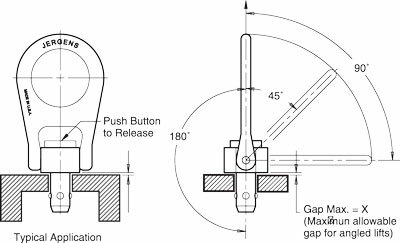 Important: Kwik-Lok® Lifting Pins are not suited for continuous rotation under load. Note: If the required hole size cannot be achieved, Jergens recommends the use of our threaded receptable. Please contact us at 866- KWIK-LOK (866.594.5565) with any questions. Required Hole Dia. (in) Max. Required Hole Dia. (in) Min. * Lifting load ratings are based on tests with hardened tool steel plates or shoulder bushings. Load ratings may be reduced if oversized holes or parent material under 80,000 psi tensile are used.